It has been way too long since I posted to the blog. I'll blame that on startup work and twitter. Up next I'm working on a blog post on the awesome wire framing tool Balsamiq. Until then, check out this great presentation from Romain Perrier on marketing your iPhone application. View more presentations from Romain PERRIER. My Mom, like most moms, is not very tech savvy. A few months ago she mentioned to me that she wanted a new laptop. I live hundreds of miles away, so the best I could do was send her a few links based on what features she told me were important to her. A month or so later she mentioned that she bought a new Dell XPS Laptop from QVC. If you're a tech person or a deal hunter you can imagine my surprise when I found out she bought a laptop from a home shopping channel. However, I quickly realized that QVC was the easiest, least threatening purchasing choice for her. Unfortunately, when the laptop showed up she was unhappy with the weight and the glossy screen. She returned her laptop to QVC and asked me to help her pick a new one out when she came to visit San Francisco. After some obligatory sightseeing we went over to Best Buy to pick out a new laptop. Upon arriving in Best Buy we proceeded to check out the numerous laptop and netbook brands they carry, including Dell, Apple, HP, Acer, and Sony. We quickly discovered that almost all of the laptops today have high gloss screens. These are great for watching movies but not so good for working in bright sunlight. Further, older individuals like my Mom have an especially hard time with the screen glare. We asked the friendly sales associate if they carried anti-glare screen covers that we could sample. He kindly referred us to Office Max. With our choice severely limited, we decided to evaluate the Macs more closely. Their screens were still glossy but not nearly as pronounced as some of the other brands. She quickly became enamored with the MacBook Air which offered everything she wanted. Notable selling points included the built-in webcam, lack of viruses, light weight, backlit keys, and general ease of use. Although her previous laptop ran XP, she was facing the challenge of learning a new OS on both Mac or PC (Vista). After settling on a MacBook Air we headed over to the GPS and digital camera sections where our frustrations were repeated. These products, like almost all tech products, are not designed for simplicity or use by older people. For example, the leading digital cameras either have microscopic buttons or touch screens with complex menus. They pack in features while increasing complexity. The cameras with simple menus or large buttons are all low-end models with poor picture quality. Finally, we went home empty handed to continue our research online and look for the best deals on the models we liked. With my assistance she was able to get some great deals online at Newegg and the Apple store. Her MacBook Air came refurbished from Apple for $999 and her Fuji FinePix came with an accessory bundle from Newegg.com. Our experience was stressful, typical, and somewhat enlightening. Once again, I realized that there is a vest unaddressed market for user-friendly technology products. The Baby Boomer generation may not have grown up in a high tech world but they have disposable income and a desire to stay connected to their children and grandchildren. Technology companies, software companies and retailers need do a better job of designing and marketing their products to this audience. If you need a tech gift for Mom (or Dad) check out my approved list below. Digital Camera: FUJIFILM FinePix - large rubbery buttons, a sliding lens cover, and bright colors make this camera a great choice. Computer: MacBook Air - Light and easy to use with a built in webcam and iChat to remotely trouble shoot for mom. GPS: TomTom 340 - Simple menus and large icons for easy use. Computer Service/Training: Apple One to One - Get going on your new Mac for $99. We all know that unemployment is at its highest level in decades. For many people this means cutting back on unnecessary expenses like eating out, that deluxe cable package, or new tech toys. But what about that $80+ iPhone bill? There isn't too much you can do about that, right? You've got to take that hour long phone interview, call in to an audio conference, or network with former colleagues. If your cell phone is your only phone, job hunting can quickly drive up your bill. Although you may be stuck with your iPhone (for better or worse), there are a few ways to keep your bill in check. This week I've been using an iPhone app called talkfree (iTunes), which goes through your phone address book and identifies all your contacts who are also on AT&T. This is great because now you know who you can call without burning through your daytime minutes. The app adds (in) next to the contact name, making it easy to surf your address book and figure out who to call next. Obviously, talkfree will be useful for many people, and at $0.99 you can't beat the price. However, for people that are currently unemployed talkfree will give you the piece of mind you need to waste the day catching up with friends (or networking with former coleagues). Things have been busy lately- very busy. Since moving from Boston in August, I've been immersing myself in the SF tech community. Although Boston has some great events (like Mobile Monday), it seems like SF has about 10 times the number of events. Over the last few weeks I've been to SF New Tech, Web 2.0 Expo, and Startup Weekend. In addition, there are are another half dozen events that made it on to my schedule. Whether you're job hunting or just looking to get involved in the tech community, here are my best of San Francisco tech events. This is consistently one of the best tech events in the Bay Area. From the venue, to the format, to the attendees, everything about this event is great. It is usually held once a month at Mighty in Potrero Hill. Presentations are 5 minutes with an additional 5 minutes of questions, and plenty of time for networking before and after. Even if you're not in the area you can watch the live stream through the website. The last SF New Tech featured Twittfilter, AdCause, and Pixelpipe among others. This international event brings together developers, business people, and "cooks" who want to pitch their ideas, build a team, and work on a project over the course of a weekend. At the recent Startup Weekend SF over 150 people show up and worked on 23 different projects (including my own cheap parking mobile app). About 80% of the teams had a product to demo by the end of the weekend and many of them are currently moving forward with their projects. For a great recap of the weekend check out this blog post. PnP is a tech incubator that has three locations around the Bay Area. The events they hold at the Sunnyvale location are a great place to meet people working on early stage startups. The guys who run PnP have their pulse on the VC community and help tech entrepreneurs understand how to found and grow their companies. Check out their monthly event calendar here. If you're interested in keeping up to date on t the latest events check out this great newsletter. Also, feel free to let me know what interesting events I've left off. The other day I came across an interesting article highlighting the explosive growth of Facebook users over 35. This trend is especially interesting in the 55+ demographic and it mirrors my recent experience. To my surprise, about a month ago my Mother-In-Law began talking about getting on Facebook. Now that all of her children and grandchildren were on Facebook, she felt left out. Why hadn't she hadn't seen that great picture her family was talking about? Why was she the last to know about a fun day of sledding? The situation got me thinking about how under served this demographic is on the internet and with technology in general. A few companies have tried to cater to them, but nobody seems to have hit the winning formula. Examples that come to mind include Eons, Web TV, and Jitter Bug. Now that the network effects of Facebook (and other technologies) are so strong, older users are ready to sign up as well. There is an opportunity to modify these existing sites & technologies to better cater to this group. For example, why not a scaled down Facebook with larger text specifically for older people? My Mother-In-Law doesn't care about 95% of the applications and isn't tech savvy enough to sort through them. However, she does want to see family pictures, maybe get status updates, or remember everyone's birthdays. How about streaming Facebook photo albums to her digital picture frame? One of the more interesting stories I've heard about older Americans on the web was from a digital entertainment conference at the MIT Media Lab. The presenter, who worked at an MMO gaming company, described how older players (55+) were joining the game as priest characters. They weren't really interested in the fighting aspect of the game but they enjoyed interacting in the virtual world. This was especially true for retired people or people with limited mobility. Many older American's have the money and are more than willing to spend it to stay up to date with their family; However, the technology has not been modified or marketed to them. Why not market the iPhone to grandparents? They would love the ability to see the latest photos, use Loopt to keep track of grandchildren, or utilize the GPS to get directions. With a little help on the setup I'd say the iPhone is easier to use than most cell phones. No doubt creating technology for older Americans can be a risky proposition. However, over the next few years I hope to see some websites that cater to my aging parents and make it easier for me to share my digital life with them. You should have seen my face on Christmas day when I unwrapped my new iPhone 3G. I spent the next couple weeks glued to the screen getting it set up just the way I wanted it. One such customization was to change the number that had been assigned to me to a new phone number. I made sure not to activate the default number and went to the At&t store on December 27th to get the new number set up. After a month of blissful usage my problems began about a week ago. I got a bill from At&t for the number I had never used. When I called customer service the agent gave me a bit of a hard time until I pointed out there was no usage for the number so clearly it wasn't active. Then I got an SMS saying that I had racked up a big text bill. I called to straighten that out and the agent discovered that my request for the 200 text plan had never gone through. Today I logged in to my At&t account to find a bill for $1,269 which had auto charged to my credit card. Apparently, when they changed my number they didn't set it up on the iPhone data plan, which is odd because the agent didn't mention that when she added my text plan. I think the interesting thing is that my iPhone bill was well over $1,000 for one month of data usage at $.01 per kb. When I was using the MediaNet plan for my old phone I didn't have a sense for how much heavy mobile internet usage would cost me so I just went with the unlimited plan. Of course, it is so much easier to use the iPhone data but I it just goes to show that At&t has decided to set up their pricing so that the unlimited plan (text and data) is really the only practical option. After over 45 minutes of talking to customer service and a $1,200 credit card charge it would have been nice if they threw me a few extra minutes for free. All the agents were friendly enough but considering I'm accruing interest on my card it would have been nice to get a little compensation. A few years back when I was on T-Mobile they would always give some extra minutes if you had a major customer service issue. Check out this great video from the archives. Classic Steve Jobs from 1984. 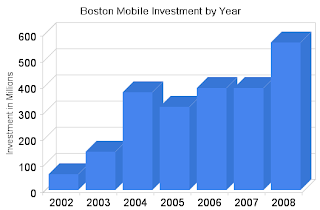 Along with the list of Boston area mobile startups, Xconomy (a great site covering Boston and Seattle startups) also posted an analysis of the total mobile investment which has been steadily growing. Interestingly, the 2008 investments were fairly steady despite economic issues.